products Savings+ and Tax Saver+. These products facilitate users to take a step forward towards financial fitness by saving money and endeavor to grow it faster. Savings+ is designed to get users in the habit of saving money regularly for their short and medium term goals - like buying a car, taking a family vacation, creating an emergency fund, etc. The product serves as a suitable alternative to traditional saving options. These savings could grow by allowing users to park them in Liquid Funds offered by ICICI Prudential Mutual Fund. Furthermore, such schemes usually have no exit load or withdrawal penalty, which gives users the flexibility to withdraw the funds whenever they need. Tax Saver+, the second product offered through this partnership, helps users save on their tax by investing in Equity Linked Savings Scheme (ELSS) option provided by ICICI Prudential Mutual Fund. Users can save up to Rs. 46,350 in taxes depending on their tax rate by investing up to Rs. 1.5 lac annually. ICICI Prudential Mutual Fund and Money View have integrated their systems to make this offering completely digital. To take advantage of these products, the user can create a new account by completing quick and easy paperless application form within the Money View app and start investing through Savings+ and Tax Saver+. The user can not only invest from the app but also manage their portfolio, invest more or withdraw funds (subject to applicability of lock-in period for ELSS) anywhere anytime with just a few taps on the Money View app. Money View operates on the philosophy of giving its users an overview of their financial picture which can enable them to take prudent and judicious financial decisions. This new feature will allow users to better manage their savings in a convenient and digital way from the app itself. More than 3 million Indians have benefitted from the app and taken a conscious decision to become financially fit. The launch of a platform offering these two products transitions the app from being a budget management app to a personal money manager by providing smart options to save and invest their money on-the-go. About ICICI Prudential:ICICI Prudential Asset Management Company Ltd. is a leading asset management company (AMC) in the country focused on bridging the gap between savings & investments and creating long term wealth for investors through a range of simple and relevant investment solutions. The AMC is a joint venture between ICICI Bank, a well-known and trusted name in financial services in India and Prudential Plc, one of UK’s largest players in the financial services sectors. Throughout these years of the joint venture, the company has forged a position of pre-eminence in the Indian Mutual Fund industry. 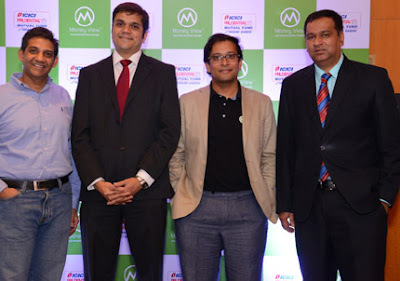 The AMC has witnessed substantial growth in scale; from 2 locations and 6 employees at the inception of the joint venture in 1998, to a current strength of around 1100 employees with a reach across around 140 locations reaching out to an investor base of more than 3 million investor accounts The company’s growth momentum has been exponential and it has always focused on increasing accessibility for its investors. About WhizDM Innovations:WhizDM, the owner and operator of the Money View app, is a technology-based financial management start-up based in Bangalore. Started in August 2014 by Puneet Agarwal and Sanjay Aggarwal, the core focus of Money View is to make financial management simple, smart and secure; thereby, enabling end-consumers to manage their day-to-day expenses and finances in today’s disorganized finance sector. Money View’s objective is to provide a platform for empowering Indians with access to easy and secure finance management solutions through the ‘Money View’ app. This android app with 3 million app downloads uses information from SMSes sent from banks, merchants and other billers to auto track, monitor and analyse the incomes and spends of users, to give them an overview on their finances and help them manager it better. All investment related services offered through the Green Account platform within the Money View app are provided by Moneyview Solutions Private Limited, a mutual funds distributor registered with the Association of Mutual Funds of India and empanelled with ICICI Prudential AMC. You can download the app at http://goo.gl/R65fGk.